JOYS OF HOME: Hooray for Me! that Christian gave away at her blog. I also received a cute tag from JuJu. Isn't it wonderful? She created it herself. Now, you all know how weird I can be about tags and awards. But, I thought this one would be great for EVERYONE to do. So I'm passing this along to everyone who is willing to try. I think it is hard for women to compliment themselves. Well, I suppose some women find it easy, but I'm not one of them. 1-I love that I'm able to make people smile and laugh. 3-I love that I can find beauty in almost anything. Now it's your turn! What do you love about yourself? I'm supposed to list 6 things I love. I thought it would be fun to show you six things around my house that I love. But before I do, please know that I have my priorities straight. First and foremost, I love my Father in Heaven and my Savior Jesus Christ. I love my husband and my family. I love my friends, in real life and blog world. Now on to the materialistic things that I love. My favorite candy bar is Snickers Almond. Or if it's just the beauty in the simplicity. I love a good quote! handwriting a book of my favorite quotes. Now I just clip them on a rack in my bathroom. blogging has blessed my life. on my blog, I count you as a blessing!!! were actually sneak peeks of my week long project? I'll show you the final reveal tomorrow. How neat. 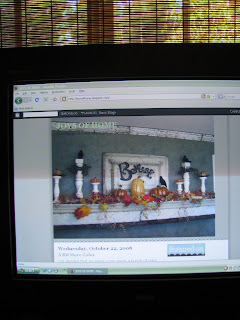 I singed up for BHG and Country Living. Can't wait to start getting the magazines in the mail. Congrats on your winning! My brother & sl listen to Dave Ramsey all the time in TN. I wish I could but don't think I can get his radio show in AR. I just love love love your blog! So many neat ideas and your home is gorgeous!!! Can't wait to see your newest creation! It looks so fun. Oh I am so excited to see it! I love the color! Congratulations on the win of the Dave Ramsey book....I keep hearing how good it is!! I enjoyed learning a bit more about you!!! Fun!! Hope you enjoy the book-I have heard good things about it. 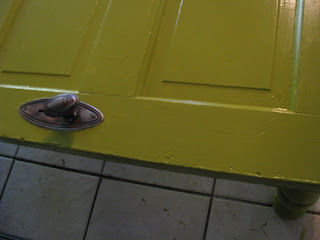 LOve the green door/table...Love the color! I love how you post your "quotes"
You bring much joy and delight to the blogworld!!! It looks like another door project! Can't wait to see it. Oops, forgot to check to see if I was signed in. I'm not Craig! Congrats on winning the book! I enjoy listening to Dave Ramsey when I'm in the car. I laughed at your "five miles, five min" because I am the same way!!! My hubs always laughs that I put so much on my list because it's never all doable in one day! Love your blog! I always enjoy seeing what you have come up with. Stop by our blog sometime...we are having our first giveaway. I can't wait to see your next project. I can't believe how creative you are! I love everything you do! We have a lot in common, however, I like M & Ms WITH my decorating magazines! Congrats! I love your quotes stash! 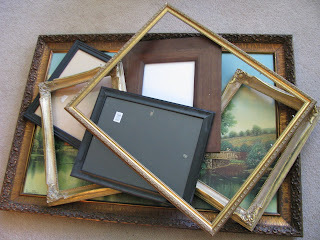 I also love frames! Well, I LOVE your blog. Loved your photos too. I adore quotes too. Oh I can't wait to see your new project. 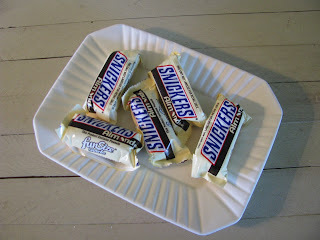 Snickers with Almond is one of my favs as well! I also love decorating mags. Sometimes I can even find them second-hand. That is a beautiful day for me! I have something for you...you don't have to post about it but I wanted you to have it! I Loved the color of your new project~how fun! I am looking forward to seeing the finished project! Congratulations and with all the 'Joy' and how to's you spread around blogland you deserve many awards! I LOVE all your inspiring and creative ideas. But even more, I love getting to know you on a little more of a personal level...thanks for sharing Joy! I love your "I loves"
Good morning Joy, I love quotes too...congratulations on your well deserved awards, tags, etc. 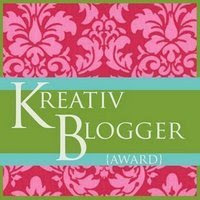 I enjoy your blog too and love your creative, fun inspiration. I bet you are even more creative since blogging...it does inspire! Oh! You and I could be sisters! When I read your list of things you love, I kept thinking "me too!" 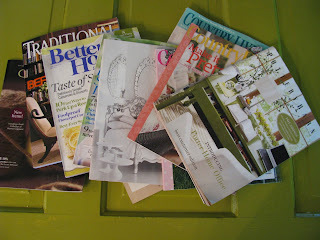 My husband calls me the "Magazine Monster" because I love decorating & home magazines (or any kind for that matter) and have piles of them everywhere! Ha! I'll have to post my answer to JuJu's tag this weekend! as a fellow lover of quotes, i am smitten with your little quote board. but i'm also curious how it looks in context in the bathroom. do you mind showing a full picture of your bathroom so i can check it out? I really like your new coffee table project! 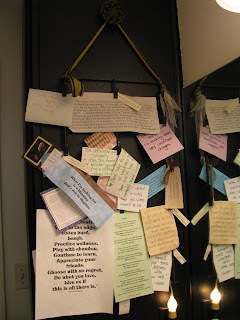 Since you like quotes so much, I thought you might want to check out an idea for displaying that I included in this post on my blog: http://robinsblessednest.blogspot.com/2008/10/lake-house-decor.html. This idea is near the end of the post. Hope you like it! I love snickers too!!! Congrats on your winning and I can't wait to see the pics of your finished project. Have a blessed day. Love the quotes. I have actually been wanting to display quotes in our powder room, but couldn't figure out a way to do it very easily (I had been considering stenciling some on the walls). I love your quote board. I'm going to have to create my own! !